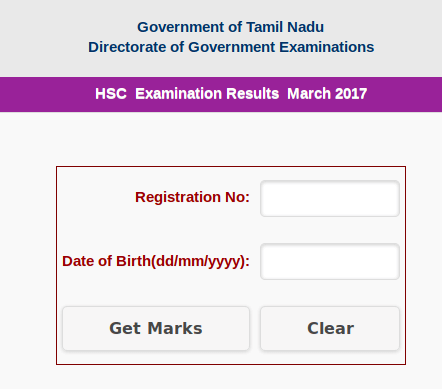 Tamil Nadu HSC Class 12 Results 2017 : Tamil Nadu HSC +2 Examination Results Released on 12th May 2017 at 10:00 AM on the official websites of DGE Tamil Nadu. Students who are waiting for their plus two results 2017 can check the website tnresults.nic.in after 10AM to get the official marklist with scores. 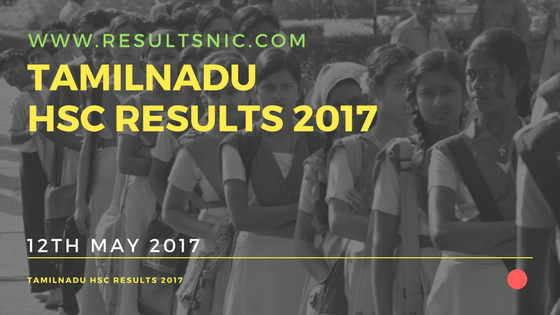 The Tamil Nadu Plus two examination 2017 was conducted on March 2017 and after the examination the valuation of the answer sheets are started on April 6 and finished April 22. Tabulation and cross checking of the marks are done afterwards. The TN HSC Results 2017 is ready to announce now. In 2017 8,98,763 number of students were appeared for the Higher Secondary Certificate (HSC) Examination in Tamil Nadu state. After the result for class 12 board exams are declared, class 10 board exam results would follow. In 2016, the Tamil Nadu HSC Result was announced on 7th May. In 2016, the total number of students were 8,26,117 who appeared for the class 12th examination. The TN HSC Examiantion 2016 was conducted from 4th March 2016 to 1st April 2016. Out of 8,26,117 candidates appeared, of which girl students constituted 445829 and 380288 were boys. Other than regular students, 74,647 candidates registered directly as private candidates also appeared for Tamil Nadu board examinations. The Tamil Nadu board 12th board examinations were held at 143 exam centres across Tamil Nadu. Established in the year 1910, Tamil Nadu Board of Education is one of the biggest boards of the country. Also, the board is affiliated to the government of Tamil Nadu, India and conducts both secondary and higher secondary examination. Board of Secondary Education and Board of Higher Secondary Examinations were merged in 2011 to create a single Board for School Examination in Tamil Nadu. TNBSE conduct examinations for Class 10th and Class 12th in the state.